When I talk about living the Tiny Life, the first thing that comes to mind is a small living space. And then people consider the lack of stuff. Then there’s self-sustainability aspect and the financial freedom that comes with it. But there are two ideas that come to mind that might not be entirely obvious: building community and reducing our carbon footprint. After decluttering the office (read about that adventure here), I ended up with a lot of garbage and recylcing. But I also ended up with a lot of items that were quite nice or unopened that were perfectly good. They were too good to throw out and too sentimental to donate to the local thrift shop. I wanted these items to be loved. I wanted someone to love having them. So, upon the recommendation of a like-minded friend, I found and joined the local Buy Nothing group. The Buy Nothing Project is a geographic community-based program whose motto is, “Give. Share. Build community.” You can read about it in more detail from their site here. But nowadays, in the city or suburbs, we don’t know each other in our community. If we don’t speak to our neighbours, how do we know they might be able to help us? The Buy Nothing Project is the vehicle by which we build community when we don’t actually know our neighbours. It works in the Facebook platform and the Buy Nothing Project’s mission statement is that each community has enough. If we shared what we have and gave away what we didn’t want, then nobody would be without. It sounded idyllic. There had to be a catch. 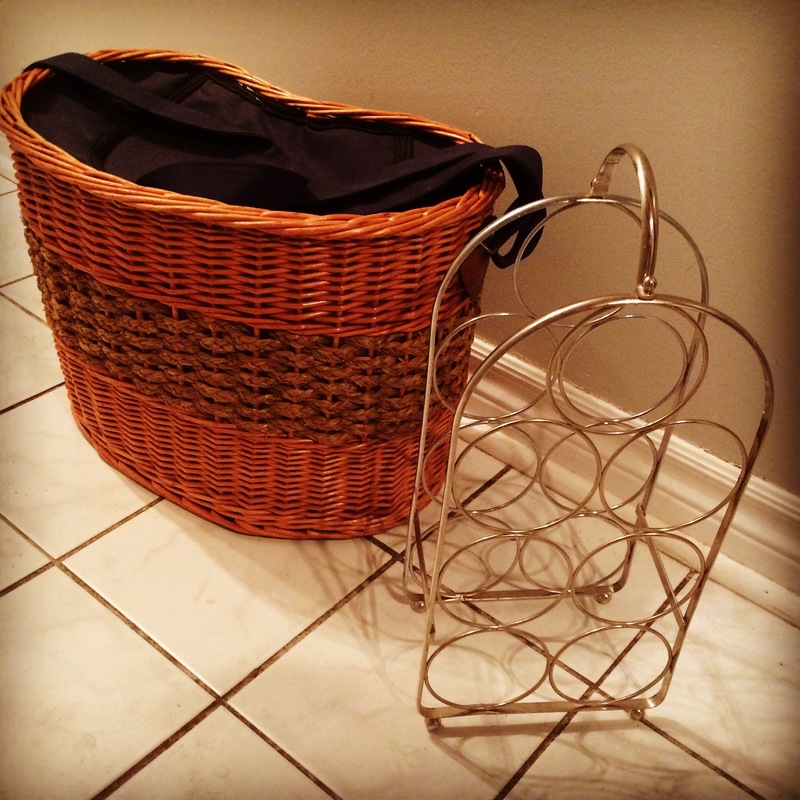 This is an insulated picnic basket and a wine rack that I was gifted from my local Buy Nothing Project. But no. It’s really that good. There are some rules. For example, you are to write on Facebook as you would speak in a conversation; refrain from using abbreviations and be respectful at all times. Another hugely important rule is that you cannot ask for money for something. You can’t barter. You can’t give coupons. Whatever you offer has to be given freely. This group is based on the premise that giving is what makes people happy. And they’re right. I joined this group to find new and loving homes for some of the items that I discovered when decluttering. I posted one photo for each item with a description and within minutes I had takers. As the gifter, I can choose the first person, I can wait and draw a name if there is more than one person interested, I can use an online random name chooser, or I can choose a person that I feel a connection with. That is my right as the “Gifter” and these types of rules are explained in detail before you join. I had posted about seven photos and I quickly became overwhelmed with messaging so the next time I posted, I only posted a couple of items. When those items were gone, I posted two or three more photos. Slowly, but surely, these interesting or beautiful items were finding good homes. The best part? The joy it brings. I’ve heard back from the people that I’ve gifted and they love these items more than I ever could have. It is such a great feeling to be able to give. I don’t know these people who are taking these items but via Facebook we message each other with pick-up times and anecdotes, comments of each others’ photos and build empathy and generosity. It has truly restored my faith in humanity. Just to give you an idea of the awesomeness that is infused into the world by this project, here are a few situations that have happened to me in just the short time that I’ve been a part of it. Someone posted that they had collected a bunch of vegetables from their garden and that whoever’s name was drawn would get a basket of fresh veg. For free. Just because she didn’t want them to go to waste and she wanted to spread the joy. Someone found unopened cold medicine in their bathroom and offered it up. I said I was interested because I had a cold that was slowly taking over my sinuses and I was the lucky one to be offered it. I picked it up on her porch that evening. Saved me $15. I was able to gift a woman a sequined shrug for her daughter’s wedding. Upcyclable items that are discovered out on the curb are rescued and then posted on the Buy Nothing page. An extremely generous person offered to do one small job around someone’s house – electrical, plumbing, painting. He had over 200 people interested in his offer! Maybe he did it for publicity as he was self-employed. Doesn’t matter because the excitement and joy that he generated simply from his offer was palpable and unextinguishable. Last week, I posted a request for a small wine rack for the holidays. Within five minutes, I had someone in my community post a picture of one, asking, “Would this work?” And you know what? It was perfect!!! Done! Picked it up that evening. Cost? NOTHING! Level of joy? Priceless. Just today, I discovered earrings in my mailbox that should have been picked up last week. If they had been posted on Kijiji and not picked up, I would simply write that person off and post the earrings again, giving them to the next bidder without informing the first person about it. But this isn’t Kijiji. And in the Buy Nothing Project, you treat people as you would friends. So I sent a quick message wondering if she was still interested or should I post them again. She got back to me, telling me that her son had been terribly ill all weekend and she never had a chance to come pick them up. I got back to her, let her know that they were still hers if she wanted them and asked if I could drop them off for her. See? This is how people are supposed to behave! This is what we are missing in our culture these days. Compassion, generosity, forgiveness, gentleness and joy. In the city, we are victims of self-induced isolation. Yet these virtues can only be found in the midst of others, in the midst of a community. In the midst of being mindful and present. These qualities are an integral part of the Tiny Life. While the Buy Nothing Project certainly does reduce my carbon footprint by upcycling, sharing and flying in the face of capitalism, it also creates a network of strangers that are willing to help and share. It has reminded me that humans want to be good and kind and that giving to others is what truly makes us happy. We have a give away group here in fsj. I was able to give my couch and love seat a new home when it was time to replace them. The coulee that came for them were thrilled! They had never had matching furniture before and I was happy to see the joy it brought them.